Nanoparticles harbour huge potential for new methods of medical treatment. But their deployment often times has to overcome a few obstacles. A person taking a walk through the inner-city of Frankfurt: this is more or less the way that the difference in dimensions between a nanoparticle and a human cell can be perceived. The particles are up to 100 nanometres in size, but usually smaller than 50 nanometres and are considered in various medical fields to be beacons of hope for new treatment and diagnostic procedures. They have been used in medicine for about twenty years so far, and in the beginning it was as miniscule ferryboats that conveyed cancer medication to its final destination. Today they are still most frequently used for cancer therapies, but there are also nanosystems for vaccinations or treatment of fungal diseases (yeast infections). Not least, their small size enables nanoparticles to penetrate into regions that otherwise can only be specifically accessed with difficulty. Typically, the active ingredients are enclosed within an organic membrane. The substances thus wander through the bloodstream and are, ideally, released upon reaching their final destination. Instead of inundating the body with medication, the dose can be reduced in this manner, and even take effect selectively. 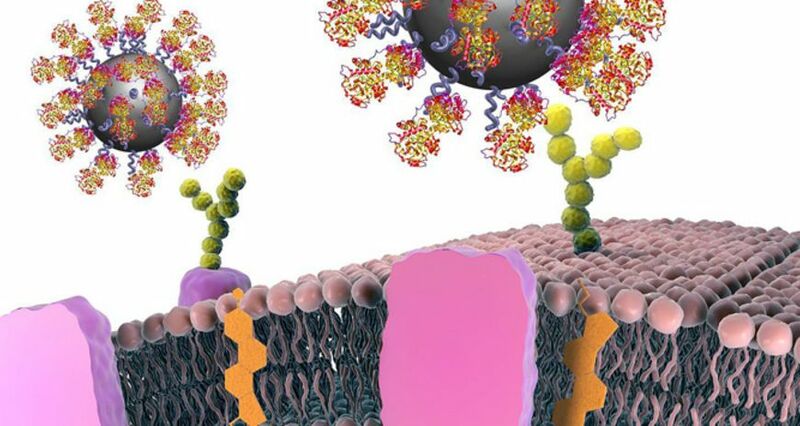 Such “drug delivery” systems are currently the most common application for medical nanoparticles – among all enterprises worldwide that offer nanomedical products, about half of them are placed in this line of business. About one-fourth of the remaining enterprises makes use of nanoparticles for imaging techniques, and another one-fifth is working on production of prosthetic products such as material for tooth fillings or bone replacement. In contrast to the conveyance of active ingredients, there are however also nanotherapies that do not involve the body itself dissolving the particles. Such a method is used for example by the Berlin medical technology company MagForce. Since 2011, they have been offering a therapy in Europe for brain tumours – for example, glioblastoma, an almost incurable cancer disease. This involves, first of all, specially coated iron oxide particles that are directly injected once through the skullcap into the tumour, where they move into the intercellular spaces. They remain there, thanks to their specially-constructed outer shell, for the duration of the therapy. In the next step, the patient is put into an alternating magnetic field, which sets the nanoparticles in motion. They produce heat thereby, which either kills the tumour cells directly or renders them vulnerable vis-à-vis attendant radiation or chemo-therapy. “As a local treatment, our NanoTherm© therapy can destroy the brain tumour in the form of a monotherapy, if the size of the tumour amounts, ideally, to five cubic centimetres or less,” says Barbara von Frankenberg, Vice President Communications & Investor Relations at MagForce. “With larger brain tumours, however, the NanoTherm© therapy can be flexibly deployed in combination with radiation and/or chemotherapy in order to increase its effectiveness, thus functioning to prolong life.” For the future, the company is also planning to be able to treat other forms of cancer using this method. In the USA, approval of a study, accordingly, for treatment of prostate cancer is currently in progress. For imaging techniques used for diagnostics, frequently inorganic nanoparticles are also used. Holger Stephan at the Helmholtz-Zentrum Dresden-Rossendorf is working on a special advancement. He is involved with ultra-small nanoparticles that only measure one to three nanometres. If you imagine a ‘normal’ nanoparticle as a pedestrian walking through the inner-city of Frankfurt, an ultra-small nanoparticle would be, analogously, a small dog who is accompanying him. The particles are smaller than individual molecules and small enough to be excreted out of the kidney. They could be marked radioactively and/or contain fluorescent markers, making them useful for imaging; they wander through the bloodstream to their final destination – as in this case, a tumour – and lodge themselves into the tissue. When a spatial image is produced of the body, for example, by means of computer tomography, the ulcer can thus be precisely pinpointed through the signal elements. “It would also be theoretically possible to occupy such particles with diverse molecules,” says the chemist. “In this manner, they can carry not only an active ingredient, but a whole series of diagnostic elements and drugs as well.” Currently he is working with his colleagues on delivering radioactively marked particles quickly enough to their ultimate destination – before the molecules have disintegrated. The biggest challenge for advancement of nano-medical methods is however the human body itself with its plethora of biological barriers. And: “The problem here is that for each application of nanoparticles the immune system must be, first of all, outwitted at those locations where it recognises foreign bodies,” says Stephan. “Most of all through the lymphatic system and the liver – otherwise, the particles will simply be ejected without having achieved anything.” The better nanomedics are at successfully accomplishing this task, the more doors can be opened for accurate and, most of all, gentle therapy possibilities – not only against cancer, but also against many other diseases.